ysabetwordsmith | Poem: "Muscadine Days"
This poem is spillover from the August 4, 2015 Poetry Fishbowl. It was inspired by a prompt from librarygeek. It also fills the square in my 8-1-15 card for the As You Like It Bingo fest. This poem has been sponsored by Anthony & Shirley Barrette. It belongs to the Polychrome Heroics series. but lying in the shade eating grapes. with an impressive yin-yang pattern. a sky-blue t-shirt that said, Hug a cop today. They may save your life tomorrow. too hot for biking or even waiting for the bus. automatically to any paired device in range." and he preferred the larger screen if feasible. as he keyed in the requested information. in school -- I'm a junior this year. to bug me about college." "Do you want to go to college?" Ansel said, tipping his head. with the teleporting," Skippy said. be skipping anymore," Ansel pointed out. my options open," said Skippy. you'd like to do for a living?" "School counselor didn't mention that." "Well, that's not very helpful, is it?" the Corner Joint after school?" "Nah, it's too far from home." how to turn that into a career," Ansel said. or it's open on weekends, we could go today." giving Ansel a bashful smile. "Then it's on the schedule," Ansel said. "That's what I thought the first time I came here,"
whole supply of water through the sprayground. the colorful equipment of the sprayground proper. "That sounds really cool," Skippy said. through the water and exploring the features. and orange invited users to invent games. different devices sprinkling or spurting water. umbrella fountains, and a dragon water slide. Rainbows flashed in the fine spray. frog spitter at once for a few seconds. conserved resources and provided interest. to redesign the "solution" to the lily pad game. which made Skippy grin at them. even without his full growth yet. they sought out the ice cream stand nearby. grew wild in the forests and hedgerows. fill you up, come back for a frozen protein shake. You boys were playing pretty hard out there." "Thanks, we'll keep it in mind," said Ansel. keep saying things like that to me." really noticed yet. It happens." through his wet pink hair. "But I'm not doing anything,"
he said. "It's just a color." "Maybe so, maybe no," Skippy said. It makes them better mates." so he hadn't paid much mind. with my appetite?" he asked. means you need to order more." of his spoon against Ansel's dish. and saw that it was almost empty. he was inhaling it that fast. some others -- even a few crayon soups,"
Skippy said. "I read up on this stuff." "So, protein shake?" Ansel conceded. the secure pocket of his boardshorts. and a Snickerdoodle for himself. and the S'mores one," Skippy said. Then he gave Ansel a sidelong look. Then again, maybe he just had. "Thanks for the tip," Ansel said. but it looks like you could teach me a lot too. so you know more about it." curling the boy's lips. "Cool." if you like," Ansel said thoughtfully. and you for the teaching experience." consider for the future, if you enjoy it,"
for the amount of work that they have." "We can register it," Skippy agreed. "I think we can help each other, really. who can actually keep up with me on foot. have those, I memorized them." he wouldn't go back on it. "Having fun yet?" Ansel asked. new friends out there today." "Yeah, it was great," Skippy said. "What about you? Enjoying your job?" Ansel grinned. "I love it," he said. "I get to meet lots of people and help them. I don't have any special powers." "But it helps anyway," Skippy insisted. who might turn out to be a fork." "I'm glad I could help," Ansel said. proven a lot more solid than I expected. More real. I'm still figuring it out." naries trying to boss us around,"
than a white one, or whatever." "That's why we need a mixed force,"
in a whole new light, soup and nary. more visible in the community. right or wrong," Skippy echoed. "We covered that in civics." of the skipping or something?" of dew down the side of his cup. didn't care about anything else." razzed you about the pink?" "Not as much as they could be,"
some serious tangles with bullies. But word's getting around now." "Friends and family?" Skippy said. 'below the neck,' if you can believe it." since the fourth of July," Ansel said. "He tried to smoke some firecrackers." in the family," Skippy said, snickering. but you just don't ask stuff like that." "It's down to my chest now," Ansel said quietly. for comparison, displaying the brown strands. chest than my head and arms, I don't know why." but his beard is curly and red," he said. my beard will do, I can't grow one yet." I realized I looked silly in goatee." "Hard to imagine," Skippy said. "The pink suits you, though. it helps with your job." scooped up their empty cups. filled the gnawing hole in his gut. still needs work. Want to pitch in?" living with disability," Ansel said. the air conditioning in his car. and I'll tell you what I think." more effectively than any towel. for post-school plans; plus the flyers and quizzes. ever worked itself out properly. that he was heading home. me about cutting the cord, but --" He shrugged. to make them feel better, so I do it." not always the same way they look from inside." and stupid first," said Skippy. his parents came out to greet them. "Fair game!" before wrapping her arms around him. grade school, so it's been a riot here." agreed to mentor me in soup stuff." "Are you getting enough to eat?" a few more burgers on the grill." around the corner on a breeze. "I would love a hamburger,"
to a gazebo in the back yard. as sweet-sharp as summer's end. Billy-Jay Nicholson -- He has fair skin, hazel eyes, and curly light brown hair cut short. He is short and husky. Billy-Jay is the cousin of Ansel Nicholson, and they have a tendency to pester each other at family gatherings. Billy-Jay is several years younger, and works on a family farm. He is accident prone due to low impulse control and a penchant for performing dangerous stunts. Poor (-2) Hey, Y'all, Watch This! Erik Seinfeld -- He has pinkish-fair skin and blue eyes. His hair is fine, straight, and blond, reaching all the way to his waist. But his beard is curly and red. Erik is married with a wife and two children, a boy and a girl. He is the uncle of Ryker Seinfeld. When Ryker was stuck at home after his accident, Erik came over and redecorated his bedroom to make it both more accessible and more appealing. Erik works as an interior designer, usually making public buildings more beautiful, but he also saves some time for family projects. However, he's fussy about keeping everything tidy, and he hates to get dirty. 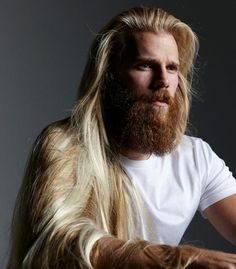 God help us if anything gets into all that hair. Indian Summer is an unseasonal flash of warm weather after the temperature cools in autumn. While typically dry and hazy in the north, it gets muggier in the south. Followup with survivors after an upsetting incident is one of the finer points of Emotional First Aid. Terramagne folks understand that trauma can create new bonds as well as destabilizing older relationships, so they take steps to maintain as many healthy connections as possible. That requires time and energy, but the investment pays off with a stronger social fabric. A sprayground is a waterpark that uses fountains instead of standing water. One stylistic difference is whether the park uses potable water in a pass-through system or treated water in a circulating system. Many Terramagne sprayparks favor potable water, and they avoid wastage by making the spraypark the first stop for water moving through a park system. It's still perfectly usable for all graywater applications such as flushing and irrigation. Dancin' Drops Sprayground in Bluehill is inspired by Loose Park Sprayground in Kansas City, Missouri. 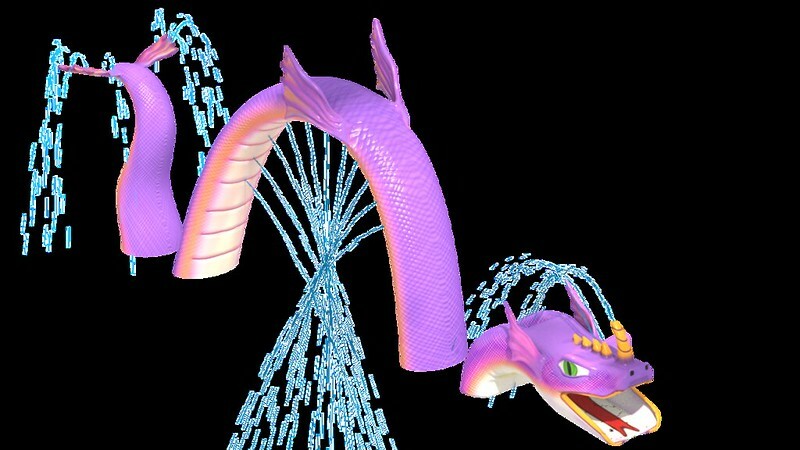 This dragon water slide has a slide through the head, a spray arch in the body, and sprinklers in the tail. 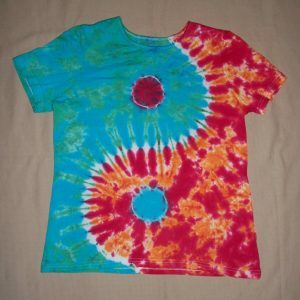 This is Skippy's yin-yang shirt. Learn how to make one. Boardshorts are long swim trunks intended for surfboarding or other watersports. Here is Ansel's "hug a cop" t-shirt. Despite the page's stingray caption, his swim trunks are actually printed with manta rays. There are a few waterproof smartwatches, but so far they're all phone-dependent, not freestanding computers like a Terramagne vidwatch. Ansel's is a very sleek and discreet model similar to this. High school graduates have many choices for their next step, but not all schools acknowledge this. Among the possibilities are educational tracks through college, trade school, or apprenticeship. In order to make the right decision, it is crucial for students to know what they are good at and enjoy doing. Learning this is the fundamental purpose of adolescence, as young people prepare for adulthood. Here's a good workbook for that process. Supportive adults can help teens explore options. Police training is one of the possibilities; people can start with college or go straight from high school into the academy. It has evolved over time, and cities that care about their citizens will invest extra resources and training into their police force for everyone's safety. Bluehill isn't swimming in resources but they do a good job with what they have. There are instructions on becoming a police officer. Muscadines are wild grapes that grow in the south, with a distinctive sweet and musky flavor. They make excellent sherbet. Scuppernongs are a subtype of wild grapes; generally muscadines are blue to black while scuppernongs are yellow-green to bronze. You can buy vines for both, but many people prefer to forage for theirs. They ripen in late summer through autumn. Frozen protein shakes resemble nutritious milkshakes, easy to make using frozen fruit. Check out the Black Forest Cake; the Snickerdoodle is a variation on the Sugar Cookie made by adding cinnamon. Superpowers often, though not always, create an extra drain on the metabolism that increases appetite to compensate. Biological ornaments are colorful or otherwise extravagant features which serve no practical purpose, but may figure into mate selection. The peacock's tail is a classic example. Although many people find visible superpowers to be off-putting, others find them attractive. The regular farmers' market in the park near me here in Philadelphia has a number of Amish and Mennonite vendors, at least one of whom sells very good baked goods, including snickerdoodles, which are a traditional treat of the Plain People. Lucky you. Around here the best source of snickerdoodles is County Market. We are quite fond of those. So is the rest of their baking or at least, all that I've tried. Thanks to Mom and Dad for the sponsorship. Re: Glad it was sponsored! Whoops, sorry that slipped through the cracks. It really bothers me how people are equating college and job status with worthiness as a human being -- and concluding that most humans have no worth, or even negative worth. It's very destructive. The people with the practical skills are doing almost all of the work. Most of the white-collar jobs are just imaginary shuffle dances. It makes people very insecure to realize there's nothing holding them up except other people's expectations. You're welcome! I'll try and remember to pass the word. I'm jumping in late to this conversation because I just found this poem today while backtracking from a newer Officer Pink thread. It hits on one of my biggest frustrations with what's going on in education. The school system I worked for focused entirely on going to college as the only option for furthering education. As a result (I think at least), it had an extremely high dropout rate. Those folks who knew they were going to college just didn't see the point of continuing. They desperately needed more options, and particularly options for more hands on, less academic, type work. In the real world, and those positions are just as valuable and sometimes more so. My niece's husband has a two-year tech school degree and works on airplanes. He found a job a full year before my niece ever did with a four-year degree and teaching certificate. Yet our education system continues to devalue this type of work. It makes no sense. Me too, which is where it came from. Absolutely. Some people are not good at academic work, and some jobs are not offered in college. All the practical stuff -- plumbers, electricians, etc. -- they go to trade schools or apprenticeships, and except for some of the union schools there is zero support for any of that. T-America does a lot better, but there is still that bias of "you should go to college." A key difference is simply that kids there are more likely to encounter an adult who says, "Hey, no, you have other options. Look at what you can do, what you like doing, and how you learn. Then decide what kind of education will help you accomplish your goals." In particular, many superpowered youth skip college because it simply doesn't teach anything they need. You can't get Teleporting 101, and if you already know geography and orienteering, then you're down to on-the-job training. College is worse than useless for a lot of people, it just wastes time and money. Terramagne really needs to collate some higher education for superpowers, at least the most common ones like healing and teleportation. They've got enough people to do it now; the problem is, they're scattered. I love me some muscadines, either straight up or as wine or jelly. I am quite fond of muscadine jelly. Sooth. Terramagne encourages that, so they know how to work with it. Ansel is good at seeing a step or two ahead, but not much farther than that. Right now he's in the process of realizing just how far in over his head he's gotten himself. Muscadines are intensely sweet. The dark ones are similar to a much sweeter concord. The lighter ones are milder with more pronounced floral notes. I got some muscats in a store once that were very much like light muscadines. librarygeek - Glad it was sponsored!